John Locke and Thomas Hobbes were known as social contract theorists as well as natural law theorists. However, they are both completely different in terms of their stand and conclusions in several laws of nature. Thomas Hobbes was an English philosopher from Malmesbury. He became famous when his book, “Leviathan,” laid the foundation of Western political philosophy. Hobbes garnered recognition in several areas; he was the champion of absolutism for the sovereign, but greatly contributed to many other subjects as well, including ethics, geometry, physics of gases, theology, and even political science. John Locke, on the other hand, has been coined the father of liberalism. He was one of the most influential Enlightenment thinkers and proved to be a great English philosopher and physician. Additionally, he was one of the first few empiricists in Britain. He even greatly contributed to the American Declaration of Independence, focusing on the classical republicanism and liberal theory. John Locke obtained his education at a prestigious institution in London – Westminster School. Once he finished his studies there, he was accepted to Christ Church, Oxford. However, he wasn’t pleased with the university’s undergraduate; was more into the works of Rene Descartes. He was also introduced to medicine and was able to obtain a bachelor’s degree in medicine at Oxford. The education of Thomas Hobbes was different. He studied at Westport Church when he was four years old. Afterwards, he got into Malmesbury School, and even got the chance to attend a private school run by Robert Latimer. His scholastic records were impressive, so he continued his education at Magdalen Hall, closely connected to Hertford College, Oxford. Hobbes wasn’t very interested in scholastic learning, so he decided to have his own curriculum. It wasn’t until 1608 that he managed to obtain his bachelor’s degree. Both individuals had varying stands on different issues. One example is the issue of human nature. According to Locke, man is by nature a social animal. Hobbes, however, thinks otherwise. He doesn’t consider man a social animal; he thinks that a society would not even exist. When it comes to the issue of the state of nature, Locke believed that in that state, men are usually true to their word and fulfill their obligations. He used the American frontier and Soldania as his examples of individuals in the state of nature; they showed that peace and property rights could co-exist harmoniously. Even though, in some places and times, violent conflicts could arise, they could mostly be resolved in a peaceful manner. Hobbes, on the other hand, made his stand on the state of nature perfectly clear in a brief statement; he said that there is no society that has no continual fear and danger of a violent death; in such a state, the life of man would be poor, brutal, short, and nasty. Furthermore, the stand on the social contract is different in Locke and Hobbes’ philosophies. Locke believed that we have the right to life as well as the right to just and impartial protection of our property. Any violation of the social contract would one in a state of war with his fellow countrymen. Conversely, Hobbes believed that if you simply do what you are told, you are safe. You will not violate the social contract because you do not have the right to rebel. 1. Locke and Hobbes were both social contract theorists and natural law theorists. 2. The two philosophers had different educational backgrounds. Hobbes was a known English philosopher from Malmesbury. On the other hand, Locke was a known doctor from Oxford University. 3. Regarding human nature – according to Locke, that man is a social animal. According to Hobbes, man isn’t a social animal. 4. Regarding the state of nature – according to Locke, man is true to his obligations and words. According to Hobbes, the life of a man would be poor and brutal in a society with continuous fear and danger. 5. Regarding the social contract – according to Locke, man has the right to life and just and impartial protection. According to Hobbes, if man simply does what he is told, he is safe. Celine. 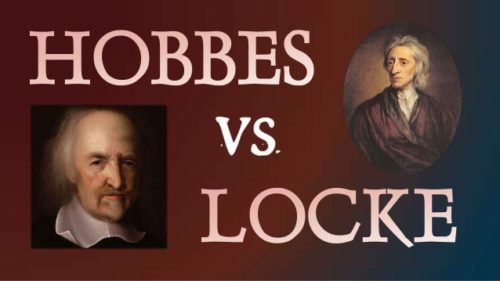 "Difference Between Locke and Hobbes." DifferenceBetween.net. May 22, 2017 < http://www.differencebetween.net/miscellaneous/politics/ideology-politics/difference-between-locke-and-hobbes/ >. Excellent comparative analysis. However, Hobbes vs. Locke assay should include that these theories took as its basic premise the assumption that their theories are a direct reflection of their thought process. They are among the theorists that focus primary on the form rather than its communicative function.